From the 10th-12th March, Beyond Europe organized a weekend of exchange and dialogue concerning the mobilization to the G20 summit in summer in Hamburg. On Friday, about 100 people took part at our discussion panel on capitalism and logistics. 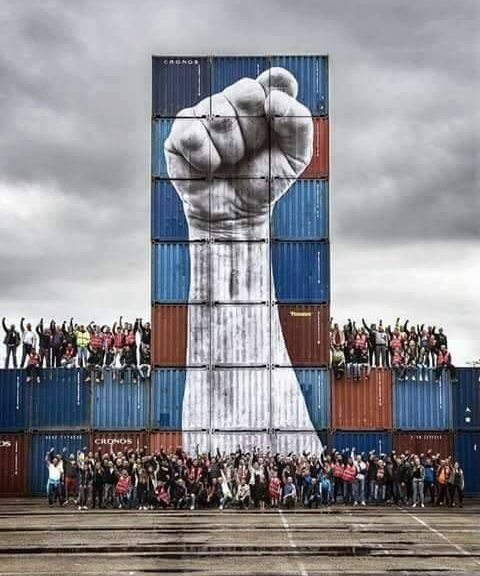 On Saturday, over fifty delegates from 12 countries had an assembly and discussed a common mobilization to the G20-protest in Hamburg with the focal point of capitalist logistics, and more specifically the harbour of Hamburg. This assembly decided to launch an open, antiauthoritarian platform based on five common points, which will go online soon. On Friday, Beyond Europe organized a panel discussion with the title “It’s the logistics, stupid? !” to approach the issue of logistics in a public format. The speakers were TPTG (Greece), the Berlin Migrant Strikers (Italy/Germany; organised in the Transnational Social Strike Platform) and …umsGanze! (Germany/Austria; organized in Beyond Europe). The facilitator from Beyond Europe introduced by explaining the non-synchronism concerning theory and practice on logistics amongst the European radical left; depending on region and political focus, the issue of logistics has experienced very different feedback as a focal point for anticapitalists. Despite the substantial role logistics plays for capitalism and always has played since the very first steps of the accumulation of value and labour-power, logistics has attracted more attention in the context of the highly modern just-in-time-neoliberalism (#platformcapitalism) relying on sensitive technology and the inter-connection it relies on. The idea of the panel was to set a common analytical and practical tone on which to work with the following days and to be worked out in greater detail in the following months. The comrades from TPTG (Greece) elaborated on the interdependence of logistics, world trade and crisis politics, especially austerity politics in Greece and the role that global harbours and other hubs play in capitalism. The Italian comrades from the Berlin based collective “Berlin Migrant Strikers” presented their approach to re-activate and re-actualize the traditional form of left-wing politics – the strike – for the relatively new field of logistics and underlined logistic’s dependence on the actual migration regime; they referred to recent experiences in labour-struggles of Foodora-workers and asked questions about the subject of struggle. The …ums Ganze!-comrade linked what was said by the previous speakers to the G20-summit as a political dilemma; the summit hosts openly authoritarian, chauvinist, resp. protectionist or even fascistic depots like Trump, Putin and Erdogan and therefore is an expression of the rise of the right wing, challenging the catastrophic and disastrous protectors of the neoliberal status-quo – none of which comes close to an alternative for the Left. Nonetheless, the G20-summit is an institution by and for the capitalist understanding of politics and therefore only simulates finding solutions to global problems, while in reality it only administers, negotiates and optimizes to keep the conditions we have – or make them even worse. This is why …umsGanze! and Beyond Europe invite all antiauthoritarians to expand the focus on the red zone – on the logistics of the summit and politics – to the logistics of capital itself; Hamburg, with its vital and internationally important harbour in the middle of a city with many connections, is just the right place for that. The discussion with the audience tackled different issues, from the importance of workers directly involved in the logistics to the question of whether logistics needs to be abolished because it is capitalist per se – and therefore anti-human – or whether it can be “liberated” from the logics of markets and profit. However, there was common agreement about the importance to keep on researching and gathering information about logistics and its deep interdependence with the current capitalist order, but also to develop this approach directly in struggles and on the streets. Therefore, unlike most summit mobilizations, the issue of logistics presents an opportunity to keep working on that field even after the big event has taken place. Saturday’s assembly started with an introduction by …ums Ganze! and the genesis of their motivation to tackle the issue of logistics on on the G20 summit action-days in Hamburg. 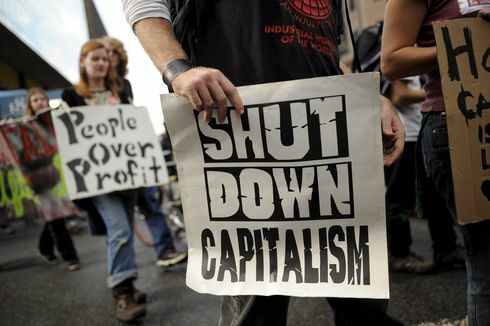 Even though in the end the G20-summit is characterized as an institutionalized event by the political elite of capitalism and therefore independently of its personal aims to adjust politics within limited possibilities to change anything (radically), it is still an important event. The above-mentioned right-wing shift has the consequence that the typical summit-situation is changed. The crisis of politics and representation is on its rise not only discoursively. The typical summit composition, where all the states-men and –women shared more or less the same market-orientated common points, is this year more heterogeneous. Presidents taking part in the summit themselves openly deny globalized capitalism and demand stepping back onto national models from the past. This makes this summit, where not everything is purely symbolic and performance, something not to neglect. For this reason, the focus on logistics is not meant to be against the mass-mobilization to the red zone – which, under circumstances described below and elaborated on during the input, is justified. For the sake of making of anti-capitalist analysis and practice more visible and expressive on that day, though, …ums Ganze! proposes to target not the red zone, but the harbour as one of the most important materializations of capitalist logistics in Europe and beyond. Logistics – next to imperialist extraction, for example – is considered an arguably central moment of the current accumulation model to guarantee capitalist production and reproduction. While it is not the level where value is genuinely produced, it is the level where distribution is secured and becomes even more important in times of sensitive, international globalisation networks and on-the-minute-deliveries. Most importantly, though, it is very good to disturb because of that high sensitive sequences it consists of. While the classical model of the shut-down of “the factory” as the value producer has not only become hard because of the fragmentation and suppression of the working class, it is way easier and more effective to disturb certain logistical nods and hubs to at least cause massive delay of a long, world-wide production chain, which is not to be located in one place like the Fordist factory. Furthermore, logistics is an issue concerning all kinds of political approaches. Be it anti-militaristic or climate struggles or anti-racist struggles. The latter have gained much attention during recent years with the numerous refugees’ bodies in the Mediterranean. This is the face of capitalist logistics: while commodities, services and labour-power can move fast and freely over borders and regions, people suffering this logic and wanting to lead a better life elsewhere get murdered. After this part, the co-organising group GROW from Hamburg gave an overview of the current situation in Hamburg. G20, especially the included visit by Trump, is a huge issue in Hamburg. Still, the police strategy is to spread anxiety of “violent protests” among the citizens. The police response is expected to be very aggressive, as the OSCE-summit (considered as a little warmup) in December showed. They will probably have around 30.000 police officers in the city for the G20-summit and improve their facilities where they can. All sides expect between 80.000-100.000 protestors from all over the world for the weekend of the 7th/8th July. Some NGOs seem to bite the panicking from police and plan to demonstrate a week earlier. On 6th July there will be a big anticapitalist demonstration by Autonomous Movement under the slogan “G20 – Welcome to hell”. 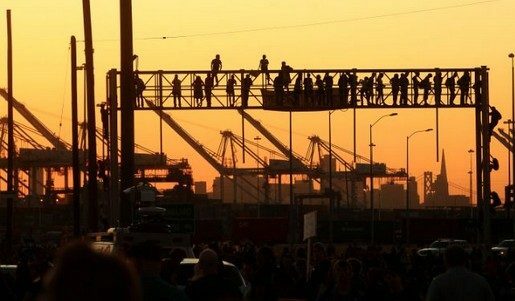 On Friday, several groups and organizations organize a day of direct actions – amongst others at the red zone and at the harbour. On Saturday finally, there will be a big demonstration through the city. Several local assemblies took place in order to demonstrate against the state of exception created for the G20 and initiatives within pub-owners (Mexican against G20) is filling the news. Further, already militant actions took place against police cars and the trade-fair in the “red zone”. The next important date for the big protest coordination is the “action conference” on 7th-9th April in Hamburg. Finally, in a first round of exchange, comrades and delegates from different countries presented their organisations, the situation in their countries and why they are interested in mobilizing for the G20-protests with the focal point of logistics. Comrades from Greece underlined their criticism to purely event-orientated politics but also described those events as a chance to connect across Europe. This point is shared by people from Sweden and Finland; they used G20 in order to overcome the lack of international connections in Scandinavia and have organized for the summit, but want to go beyond that. Not only have they direct contact to the striking dock workers in Gothenborg (Sweden), but they already are organizing busses to bring several hundred comrades to Hamburg in summer. Comrades from Brussels announced that there is already a “No G20” collective in their city and that they are using the NATO-summit and Trump’s first visit to Brussels in April as a mobilization point towards Hamburg. Delegates from Bern and Geneva bring certain experiences in summit-protests since they organize actions regularly against the Davos-summit there. Italian comrades elaborated on the point that focussing logistics does not only mean to focus the transport of commodities, but rather focussing a social and economical regime, which concerns migration amongst others. A comrade from the UK picked up that point and underlined the necessity to criticize nationalism and the nation in general in the context of this mobilization. A similar point was made by people from Cyprus, where the “Cyprus issue” torns apart Greek and Turkish Cypriots and mobilizes several nationalisms. The …ums Ganze! proposal of organizing actions south of the river Elbe, in the harbour area, in order to tackle the logistics was received well. Nevertheless, a lot of questions came up and showed that any action needs a lot of planning. Practical Internationalism, however, does not mean that the local group prepares everything unitl the ultimate detail and offers it to non-local comrades in a “do or die”-style. On the contrary, it means planning and preparing the approach and the action itself together from the very beginning; this is how a real trans-national narrative about logistics, the harbour of Hamburg and its relation to the G20 protests can be achieved. Of course the local organisation has a special responsibility, but as delegates of …ums Ganze! underlined several times, they are no experts on the issue of logistics and are dependent on a collective process with comrades from other countries to succeed. So, a lot of important points and issues to work on more concretely were brought up in a common discussion. Questions like the following need to be developed in near future: Who is the subject of the action? What should be the expression? How should it be done? When is it a success? When is it to be aborted? Are there alternative plans? And so on.